Q and A: What Is Viscose? While cotton and rayon fibers are both made from the same polymer (cellulose), cotton’s cellulose is grown in five to six months by plants. Rayon’s cellulose is produced from trees, which require a much longer time (years) to grow before they are big enough for harvesting. The trees are chemically processed to remove everything (bark, lignin, etc.) but the cellulose, and then the remaining cellulose is regenerated into man-made fibers. Since the molecules in cotton consist of longer cellulose chains than those in rayon cellulose, the longer cotton molecules are also packed more in-line (crystalline areas) with each other than rayon’s more random (amorphous areas) molecules. Both of these molecular qualities combine to make cotton fiber much stronger than rayon fiber. The same two molecular properties also lead to the amazing fact that cotton fibers increase in strength when wet, whereas viscose rayon fibers lose strength when wet. Improved wet strength is important for dry wipes that are used to absorb spills, and also for added strength in pre-moistened wet wipes. Higher wet strength is also an asset for medical products that are used to clean, protect, absorb bodily fluids, and even to support organs during surgery. Cotton fibers come from plants and there are many varieties of seeds used to grow it. The type of cotton seed used is primarily determined by the conditions in the area where it is planted (wet, dry, short or long growing season, etc.). Viscose rayon can be produced from any number of trees, grasses or even cotton, as they all get their strength from cellulose. Some rayon fibers are produced using bamboo (which is a grass) as the cellulose donor. Recently some false claims were made labeling rayon fiber made from regenerated bamboo plants—consumers were led to believe that these are natural fibers that come directly from bamboo—but “regenerated” is a key word here. Though produced from bamboo, this regenerated viscose rayon fiber is not natural. This caused the Federal Trade Commission (FTC) to take action to have the product manufacturers remove this labeling. Cotton is also grown right here in the USA across the southern tier states, from Virginia all the way to California. There are no (zero!) producers of viscose rayon in North America. For every pound of fiber harvested, there are roughly 1.6 pounds of other useful products being created, such as cottonseed oil, cattle feed, and mulch. 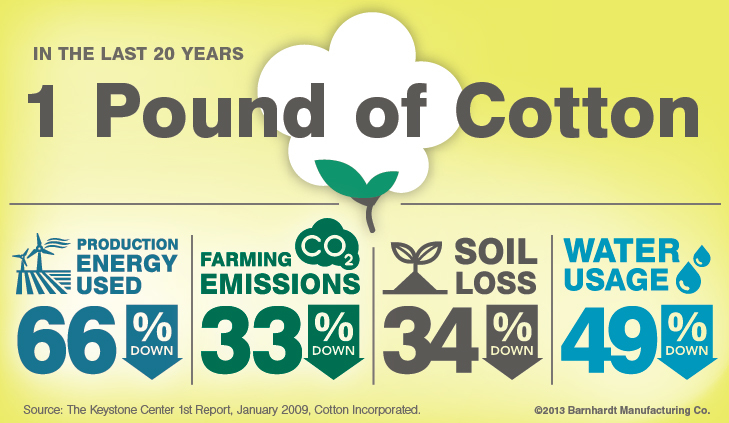 In fact, over the last 20 years modern cotton farming techniques have reduced the energy used by 66%. In addition, over those two decades water usage has been reduced by 49%, carbon dioxide emissions has been lowered by 33%, and soil loss has decreased by 34%. All of this has occurred while new seed varieties have reduced the amount of pesticides used by 23%. 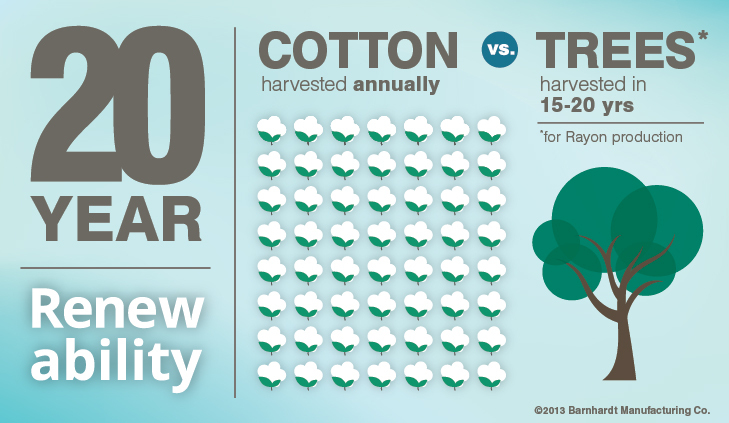 With cotton farming techniques, less will always mean more, especially when it comes to sustainability. Let's look at the steps involved in producing purified cotton and viscose rayon. Viscose rayon can be made using any raw scour of cellulose, but since the vast majority produced commercially uses trees, we will take look at that step in production. As you can see by the diagram below, the process is far more simple for producing purified cotton fibers. Knowing your fibers means understanding everything about them, from how they are farmed to their distinct properties in a variety of situations. While we certainly have our opinion on the winner in Cotton vs. Viscose Rayon, we’ll leave it up to you to decide who takes home the crown. Editor's Note: This article was first published in December 2013 and has been updated for accuracy and comprehensiveness. This entry was posted in Know Your Fibers and tagged cotton, rayon, sustainability, viscose. Bookmark the permalink. Is a 50:50 combination of cotton and Viscose good? Yes any blend of cotton and rayon would have the same breathability, provided the yarns and construction (knit or weave) are the same. Cotton flex fabric is made from yarn that has a elastomeric filament (Spandex) in the core and the cotton is spun around the outside if the filament. This way you have the comfort of only cotton on the skin and the stretch and recovery of elastomeric fiber. My question is rayon would normally cost more to the consumer, because Of the Long process it takes to make it? If you are comparing cotton fiber from the field this is true. Both are commodity driven so price can vary. I am looking at three rugs, all handmade in India. One is 100% wool, the second is 70% wool / 30% rayon and the third is 50% wool / 30% viscose / 20% cotton. Which will give the best wear? I would expect the 100% wool to ware the best. Viscose can absorb twice the amount of water than cotton. Absorbency capacity is closely related to fabric or product construction. Purified cotton in fiber form will absorb over 24 times its weight in water as measured by USP testing. When a clothing product says cotton bamboo is it the same thing as rayon or is rayon different because chemicals used to make it? There is no such thing as cotton bamboo. There could be a blend of cotton and bamboo fibers in a product. In which case the bamboo is rayon that is made from bamboo. I love natural…to an extent. Let’s be true about it: Linen clothes you can wear for a very long time – but you have to always have iron in place. Cotton is nice for summer t-shirts but if it’s autumn or winter it’s catching water easily and drying slowly, it’s also ‘cold material. The best natural for winter is wool- definite winner – even if it’s getting wet easily it’s warmest, but polar if it’s cold, but not freezing is also very good. Everything depends for when and what you need certain type of clothes. Synthetics or other ‘less natural’ are great for hats or jackets and many other things, natural also have their pros.